Belper's Congregational church is on Green Lane. 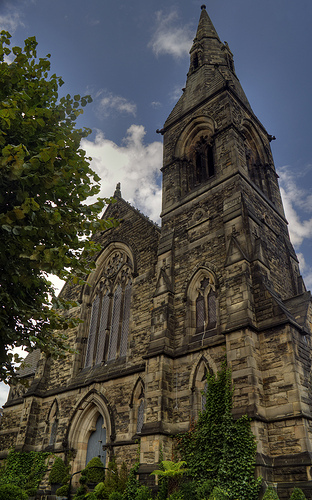 This church was built in 1872, to the design of George Woodhouse, a Bolton architect better known for his textile mills and factories in Lancashire. The Church was originally established in 1789 when Belper had only three other places of worship, and a rapidly growing population. As the Unitarians were moving to a new building, the Congregationalists were able to rent their old one. In the 1790's a half acre of land was purchased, and a chapel built and completed in 1799. This church was enlarged on various occasions but demolished in 1869, a new church, which is still standing today, being opened in 1872 at a cost of £5,000 which included a separate Sunday School built from the material of the original chapel. This church too became unsafe and with tremendous effort and pride the small congregation saw the completion of another new church behind the older one and built on the site of the former Sunday School. Most of the gravestones were removed and placed around the walls or laid flat at this time. The church registers are held by the Secretary of the Church. Burials date from 1799 and baptisms from 1793. The latter may be copies of the originals which were handed into the Public Record Office and are listed as 'Belper & Heage Independent Chapel’. After lying derelict and open to the elements for a number of years, the old church was repaired and rebuilt as a private dwelling. On sale again in 2018, interior photos here. "1914-1919: In Proud and Glorious Memory of Our Boys"
Born Sep'. 23 1840 June 16 18---. TOMLINSON John son of John and Mary Sep 1 1839 1 yr 5 mth. These Memorial Inscriptions appear by kind permission of the Derbyshire Family History Society. Their website is located HERE. Books, fiches and other materials on Belper, as well as other Derbyshire districts, may be obtained from the Society. Here you will find historical data and social records. Many people around the world are seeking for information on their Derbyshire ancestors. This website and its records may help, but there is no guarantee and the records are patchy. Please see the contact page for detailed information. This website is not affiliated to any Council, Government or Social group.